EPRI’s new cheaper, more efficient fast charger could be a first grid application for solid state transformer technology. Solid state transformers, devices that “digitize” the grid’s alternating current for fine-tuned control of complex power flows, has been a tantalizing, yet distant technology for the smart grid for years now. If it’s going to penetrate the grid, it’s likely going to start out in specialized settings -- such as, for example, helping to fast-charge plug-in electric vehicles. That’s the idea behind the Electric Power Research Institute’s new Utility Direct Fast Charger being tested this Thursday, Feb. 23, in Knoxville, Tenn. EPRI will connect a Nissan Leaf and a Mitsubishi i-MiEV to its new direct-current fast charger, aimed at improving efficiency and reducing the complexity of today’s fast charging systems. It’s also another test of EPRI’s underlying “Intelligent Universal Transformer” technology in a new application. Solid-state transformers are theoretically useful in many different applications, particularly in situations where traditional grid infrastructure struggles to meet new challenges. 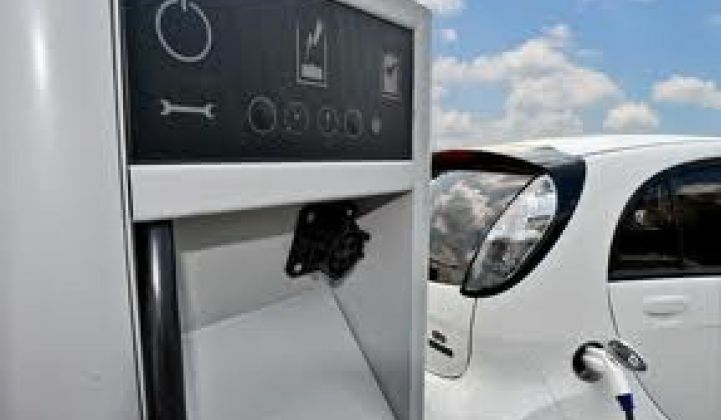 As a research organization, EPRI doesn’t commercialize its own technology, but fast-charging plug-in vehicles could certainly be one emerging market in which it could seek licensing partners or other avenues to bring its technology to commercial scale. EPRI’s system doesn’t replace the fast chargers themselves. Instead, it replaces the power transformers and other equipment needed to hook a fast charger to the medium-voltage grid that supplies them power, Arindam Maitra, EPRI senior project manager, told me in an interview last week. EPRI’s system is promising power conversion efficiencies of about 96 percent to 97 percent, compared to the 89 percent to 91 percent achieved by today’s fast chargers combined with the three-phase supply transformers they need to draw power from the grid. Beyond offering variable voltage transformation, EPRI’s AC-to-DC-to-AC IUTs could also replace building transformers to better manage power quality, reactive power and other functions, all while also serving as a hub for fast car charging. On top of that, EPRI’s system is built to connect relatively simply to medium-voltage distribution lines, compared to the multiple transformers needed to convert that power to voltages suitable to DC fast charging, Maitra said. That means EPRI’s system is about one-fifth the size of the alternative, multiple-transformer setup, he said. It also weighs in at about 150 pounds, while the transformers used today weigh about 800 pounds and require lots of protective fencing and other safety features, he added. These traditional power conversion systems can also add $20,000 to $30,000 to the cost of installing a fast-charging system, Maitra told me -- in other words, about the same cost as the fast-charging gear itself. Right now, EPRI’s system, built in partnership with EnerTronics and the Tennessee Valley Authority, has a bill of materials for its off-the-shelf parts that comes in at about $29,000, he said. Maitra added, “We feel that the cost can be lowered, if not made comparable to, the commercial market." That’s a pretty concise summation of the advantages of solid-state transformers across a wide variety of use cases, by the way. Because these AC-to-DC-to-AC digital transformers are digitizing real power, not a separate communications signal, they can actually add data -- such as the place the power was generated, where it came from and where it’s supposed to go -- to the power itself in the midst of doing their jobs as transformers. That’s led to concepts like Power Tagging’s digital power signal data technology, and could make real the idea of tracking renewable energy from source to consumption. EPRI hasn’t taken its IUT-based charging system that far yet. In fact, it hasn’t yet addressed how it might bring the patented technology to commercial scale, such as via licensing or selling to manufacturers, Maitra said. But EPRI is talking to a wide variety of DC chargers, including those being built on the Japanese CHAdeMO standard, as well as fast-charger manufacturer Eaton, he said. EPRI hopes to have commercialization partners signed up some time this year, he added. As for other uses of medium-voltage IUTs, Maitra said EPRI has been testing it for conservation voltage reduction on distribution grids. Solid-state transformers could also be useful in managing grids subject to lots of two-way flows of power from distributed solar panels and other on-site generation sources. At a larger scale, solid-state power gear could serve as interconnections for large-scale grid systems, such as connecting Japan’s two major grids that run at different frequencies. Japanese companies including ORIX Corp., NEC Corp. and National Instruments have formed the Digital Grid Consortium to study how solid-state transformer technologies could be applied to solving some of that country’s pressing power needs. In the United States, the proposed Tres Amigas project to interconnect the country’s three main grids could also make use of solid-state, AC-to-DC-to-AC transformers. Of course, we’ve got plenty of lab tests and pilot projects ahead of us before any of these applications of solid-state transformers find their way into real-world applications. But of the many applications, fast charging may be one of the most pressing, given that government-backed projects in the U.S., Europe and Asia are pressing ahead to install them, Maitra noted.